Act #142: Don't miss out and cross the street to visit that "other" place. 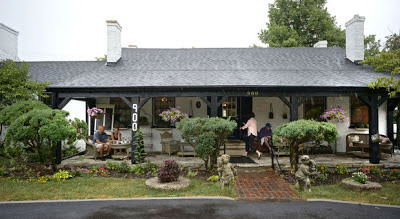 Yesterday I met a girlfriend for lunch at a quaint lunch spot called Georgia's Kitchen in Lexington, KY. This place has been around for years (under different names) and is the type of place that affluent retired women hold their garden club meetings and privileged brides meet with their mothers to finalize wedding plans. After we walked through the eclectic, vintage-inspired gallery, donned with lace curtains and beautiful chandeliers, my girlfriend and I feasted on perfectly grilled fish, fresh, locally grown greens with balsamic vinaigrette and decorated with vibrant, colorful edible flowers, mango iced-tea, and freshly made cappuccino ice-cream. We sat on a charming patio surrounded by a lush green herb garden, the kind that makes you want to forget that you have to go back to work. Our servers, dressed in all-black, were most gracious and tended to our every need. I never went without mango iced-tea. My bill was $19.82, which is about 3 times more than I typically spend on a weekday lunch. As I was leaving the parking lot, my eye-caught something bright and yellow directly across the street. I surveyed a little closer and saw the most colorful and intriguing roadside stand with a playful sign and a neon-lit open sign, with at least 10 people lined up at the window and tables full of happy ethnic (presumably Mexican) men chowing down heartily on something I couldn't quite see from where I stood. The place was called Maria's Kitchen. I have been hearing about this place a lot over the past few months. One of my colleagues swears it has the best, most authentic Mexican food in town. The kind of place you can get a refreshing Mexican cola made with real sugar cane, with menu items you can't find anywhere else in town like barbacao tacos, and poblano cheese gorditas, Wednesday fresh tamale night, and apparently to-die-for tres leches cake - all costing somewhere between $2-$7. The place literally looked like an open-air food stand- the kind that I've seen on the bustling streets of Thailand and Mexico. The entire restaurant consisted of a walk-up ordering window and only two tables covered in bright yellow (with blue flowers) plastic table cloths. 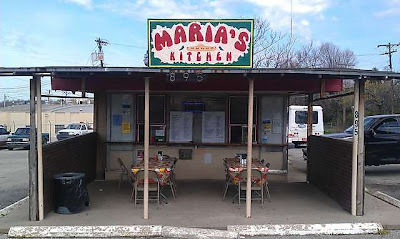 The on-line reviews were impeccable, even the one warning readers that it was located in a "sketchy" neighborhood, couldn't resist glorifying the quality of the food. As I drove away I reflected on the fact that these two, drastically different, "kitchens" stood directly across one another on the same street - yet one was in a "sketchy" neighborhood, and one nestled in a breathtaking herb garden. I wondered if patrons from either have ever made that bold trek across North Broadway to taste what the "other" kitchen had to offer. I wondered if they did, whether or not they would feel welcomed, or if they would be so mesmerized by the tres leches (or cappuccino ice-cream), that their discomfort and qualms would disappear. I wondered what they - what I - might be missing out on by not opening my world up to other kitchens, and although my grilled salmon salad left my stomach pleasantly satisfied, for some reason, I just couldn't stop thinking about sinking my teeth into an ooey-gooey poblano cheese gordita. I'd love to try both! Really very interesting blog. Thanks for sharing htis.